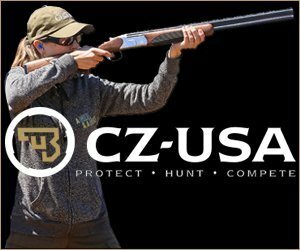 If you are reading this excellent magazine, my assumption is that you have more and better training than the average gun owner. You’ve taken courses, thoroughly thought about whether to carry concealed or not, and the four rules of gun safety have become part of your subconscious competence. By extension, you are probably an above-average driver, drive defensively, and obey all the rules of the road. Yet, still, accidents may happen. You carry automobile insurance, which you may have never used. You may have a first aid kit in your car, perhaps in the trunk of your car (I know mine is), which, hopefully, you’ve never had to use. You are mild-mannered, are not subject to road rage, and don’t go to questionable areas, especially in off-hours. All statistics say that gun safety has never been higher, and accidental shootings have never been lower. Yet again, sometimes they do occur. While extremely unlikely, there is a greater than 0% chance you could be involved in an accidental shooting, either from a buddy, someone else on the range, another hunter, or, more unlikely still, self-inflicted (that split-second of inattention). There is also that very small chance of being shot by a criminal. If such an unlikely occurrence does come to pass, the trunk of your car is far away. EMT 911 response is even farther. 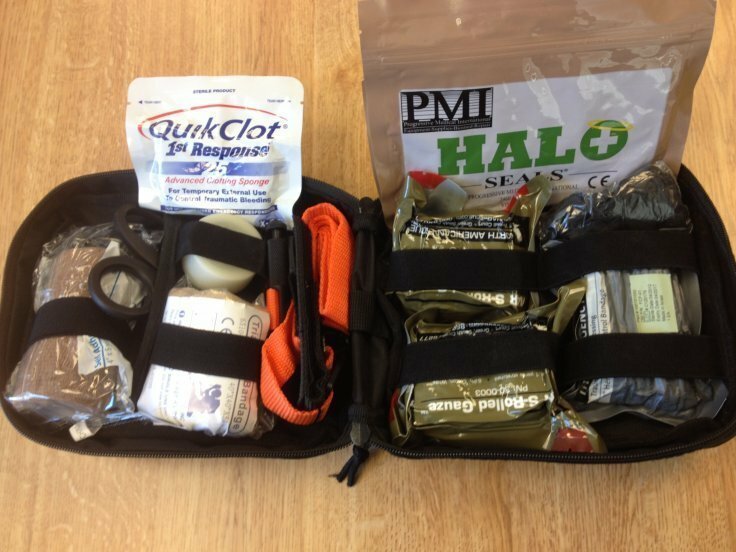 While both Defensive Training International Trauma Kit of these are superb options, and, most likely, WILL save the day, sometimes an instant response is necessary. To that end, John Farman has had this Defensive Training International (DTI) Trauma Kit designed to his specifications, specifically to treat gunshot wounds. This compact package is contained in a small M.O.L.L.E. pouch, because, as he notes, the bigger the kit is, the less likely you are to actually have it with you. John Farnam, president of DTI, is a combat veteran (a major [retired] in the US Army reserve), a former police officer, a renowned author, lecturer, and expert witness, and one of the top handgun instructors in the world. He has taught countless police, military, federal & state agencies and civilians, both here and abroad. Farnam teaches a Tactical Treatment of Gunshot Wounds (TTGW), as well. The kit has no band aids, analgesics, or the like. Containing hemorrhage control and emergency trauma equipment, its sole purpose is to prevent unnecessary deaths in these circumstances. Farnam states that the kit addresses the three primary causes of unnecessary death from gunshot wounds: blood loss, compromised airway, and tension pneumothorax. The Israeli Battle Dressing (IBD), internationally patented and FDA approved, has been a trauma staple for years. It combines multiple hemorrhage devices in one: primary dressing, pressure applicator, secondary dressing, and a foolproof, built in way to secure the dressing in place. It is vacuum-sealed, sterile, can be used by anyone, and is easy to use on yourself. Direct pressure is the primary method to staunch blood-loss, and should be the first to employ. If that proves inadequate, or the wound is in a location where a tourniquet is not practical & the IBD would not be capable of providing sufficient pressure (such as the abdomen), a package of Quik-Clot Combat Gauze is provided. This gets packed into a wound, and, with the kaolin (a hemostatic agent impregnated into gauze), works to immediately initiate the clotting cascade on contact with blood—much faster and greater than the body’s process on its own. In the event of extensive arterial bleeding in an extremity, the above two methods may well not work or suffice. The SOF Tactical Tourniquet was chosen for its speed of application and ease of use, plus John considers it one of the easiest to self-administer. This tourniquet, and others, are designed to control severe arterial bleeding. While optimally placed on the upper arm or leg, positioning is situation driven—but doesn’t work over joints. Both with IBD & tourniquet, the key is speed. There are two other potentially exigent situations this kit is designed to deal with—airway collapse due to low blood pressure/blood loss driven unconsciousness, and tension pneumothorax. The nasopharyngeal airway is included to address the former. It is inserted straight back into one nostril (not up or down) and is designed to provide a patent airway past the tongue, which can obstruct the airway of a deeply unconscious victim. A tension pneumothorax can occur with a wound to the chest, air can get into the inter-pleural space (area around lung or lungs) and build up pressure. This potentially can collapse the lung on that side, and eventually compress both the good lung and the heart. This can lead to a rapid deterioration of the patient’s ability to maintain oxygenation. The SOS Chest Seal can be applied directly on a chest wound, and will generally adhere in spite of blood and dirt. Two seals are provided should there be an entrance and exit wound. This seal prevents air from entering the chest via the wound, preventing a pneumothorax from becoming a tension pneumothorax. In the event that a tension pneumothorax has already developed to a critical point, a sterile, sealed decompression needle is provided in the kit to release air trapped in the pleural space. The needle is inserted into the second intercostal space, between the ribs—it is then withdrawn, leaving a small tube to continue to release trapped air. While this does not re-inflate the collapsed lung, it will allow the good lung to function, and the heart to circulate blood more normally. Now, hopefully none of us will be seeing combat, but these are interesting statistics. In any emergency, you will default to the level of your training. If you’ve never applied a tourniquet or an Israeli Battle Dressing, I’d recommend purchasing extra units and practicing with them. Deploying a decompression needle or nasopharyngeal airway, however, is a whole ‘nother ballgame. Trying to staunch a loved one’s, friend’s or your own serious bleeding is not the best time to read the directions on the package (which are quite clear and useful, by the way). Another option is taking DTI TTGW ($390)―a one day course developed by Doc Gunn, aka Anthony M. Barrera, M.D., and instructed by John Farnam. It is based on Tactical Medicine, but, while that is designed for military/police tactical entry team members with specialized medical training, this course is for nonmedical personnel. TTGW not only teaches identifying the three, major, life-threatening injuries, and how to treat them in the field, but it is also a shooting course about exigent circumstances. I’ve taken other courses with John, and I can highly recommend them. Yet another option would be a local first responder or EMT course. Even if you feel you’ll never use the needle or airway, having them available might prove providential if a trained bystander is nearby. They’ll try to help, but won’t have any supplies, but you’ll have the Trauma Kit. While it is $187, that is a bargain if ever needed. It’s available from R&R Outfitters, a veteran owned company, and from the DTI website.